DESCRIPTION -- With 2 available to purchase this is a dining plate from the Royal Navy and an as used in service item. It is 8"(22cm) wide and it is in an excellent condition and dates from the 1950's (click on the picture to see a close up of the crest). DESCRIPTION -- Original as used side plate from the Royal Navy which shows on it the naval crest. The size is 6"(16cm) wide and it is in an excellent condition and dates from the 1950's (click on the picture to see a close up of the crest). HISTORY -- An interesting fact is the official history of the Royal Navy began with the formal establishment of the Royal Navyas the national naval force of the Kingdom of England in 1660, following the Restoration of King Charles II to the throne. 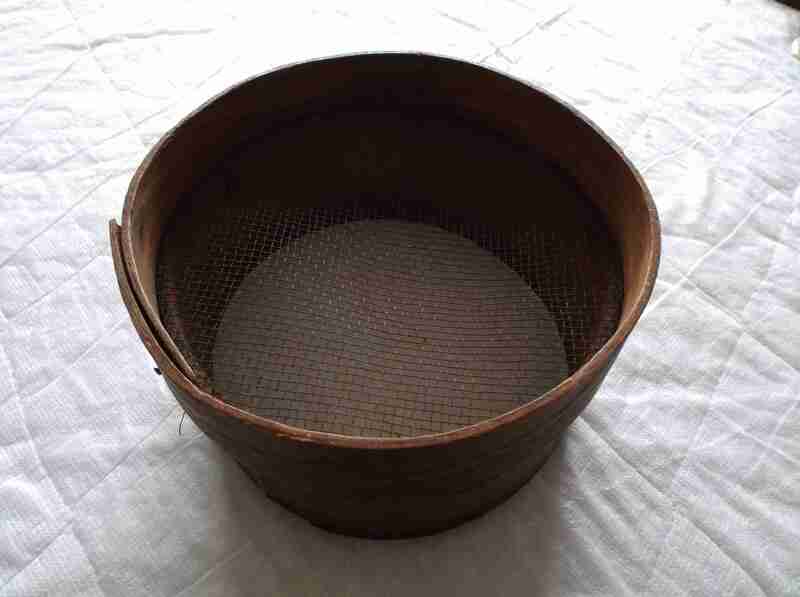 DESCRIPTION -- Early item is from the Royal Navy and would have been used on board a vessel which is a wooden sieve which was used for refining gun powder. The size is 6" (15cm) wide and it dates from those used in the 1870's/1880's and is a real piece of history (click on picture for a closer look). 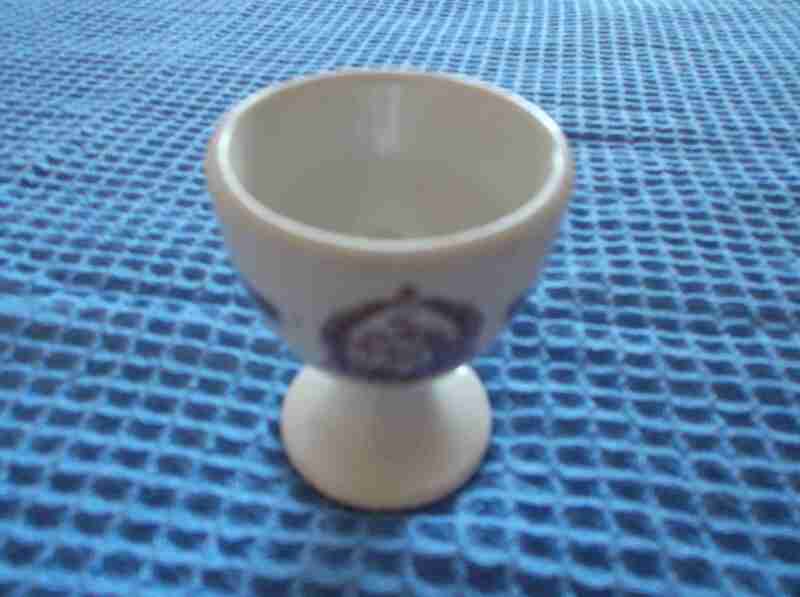 DESCRIPTION -- Dated circa 1930's/1940's this item is from the fleet of the Australian Navy and is a china egg cup which shows on the front the company houseflag and is in a great condition and unusual find. HISTORY -- The history of the Royal Australian Navy traces the development of the Royal Australian Navy (RAN) from the colonisation of Australia by the British in 1788. Until 1859, vessels of the Royal Navy made frequent trips to the new colonies. In 1859, the Australia Squadron was formed as a separate squadron and remained in Australia until 1913. Until Federation, five of the six Australian colonies operated their own colonial naval force, which formed on 1 March 1901 the Australian Navy's (AN) Commonwealth Naval Force which received Royal patronage in July 1911 and was from that time referred to as Royal Australian Navy (RAN). DESCRIPTION -- American naval item and a rare find which is a silver-plated dish souvenir originating from the American naval destroyer the USS San Marcos. It is a circular dish around 5" (13cm) wide and shows the vessel embossed in the centre with a roped edge finish. HISTORY -- USS San Marcos (LSD-25) was a Casa Grande-class dock landing ship of the United States Navy, named for the Castillo de San Marcos, the oldest masonry fort still standing in the United States. San Marcos' keel was laid down on 1st September 1944 at the Philadelphia Navy Yard. She was launched on 10 January 1945, and commissioned on 15 April 1945 with Commander L. E. Ellis in command. DESCRIPTION -- Superb Admiralty Officers ships mess bowl, which is in a very good condition. It is a large size and was produced for the Queens Coronation in 1953 and it has a gold logo to the top with the size being 9" (25cm).